Greetings! 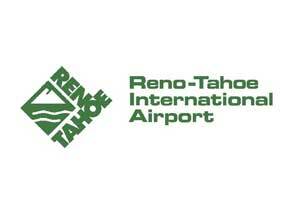 And welcome to the first edition of Nevada Past Times, the weekly column at OnReno.com that will take a look at the history of the Northern Nevada region with stories about some of the more interesting characters and events that shaped and molded the Truckee Meadows into what it is today. For the first installment, I thought it might be a good idea to get an overview of the area’s history and perhaps a preview of some of the stories that will be featured in this space. Some of them you’ve probably heard or read before, but we promise to find the lesser known facets of Northern Nevada history that may surprise you to know actually happened right here. We’ll skip the cooling of the earth’s core and the events surrounding the dinosaurs that roamed hereabouts since it is proven that dinosaurs did not keep very good historical records. The first settlers in the area were the vast Northern Paiute tribe and the smallerWasho tribe who arrived just over ten millennia ago. The Paiutes could be found just north of what is now called Pyramid Lake and could be found from the eastern foothills of the Sierras in that region all the way to what is now the Oregon/Nevada border. The Washo lived south of Pyramid Lake, including the Truckee meadows, Lake Tahoe, Washoe Valley, Eagle Valley, and eastward to the modern-daytown of Yerington. A wise and practical people, the Washo lived wherever fresh water was readily available (as evidenced by the settled locations I just listed) because they knew that not only did they need the water to survive, but fresh water sources were gathering places for animals to be hunted, and fish to be caught. The Paiute and the Washo tribes lived in peace for the most part, but on occasion, disputes would arise and were settled at a sacred battle ground at a natural landmark on the shore of Lake Tahoe known today as Cave Rock. The battles were essentially a deadly game of King of the Hill, as the last warrior or group of warriors left standing atop the rock were the victors. Imagine the logistics of staging such battles the next time you drive through the tunnel up there. The first of the European explorers arrived in 1827, though the territory hadpreviously been claimed by Spain as part of Mexico, it had not been surveyed or explored. Jedediah Smith led a company of men from the Rocky Mountain Fur Company looking for new territories for which to trap and harvest fur bearing animals. Smith noted in his ledger that there were large lakes of fresh water, plentiful in the region. But since he never got more than 75 miles south of the Truckee Meadows, he had missed Lake Tahoe entirely. One imagines his entry might have been more excitable had he gotten to see the body of water now referred to as “The Jewel in the Sierra Nevada Crown”. In the years afterward, the trickle became a stream. The Washo gained a reputation for hospitality, and in point of fact, everything with the word “Truckee” on it was so named for a friendly Washo Chief who helped a group of settlers survive a particularly rough winter. If only the Donner Party had known about this hospitality when they began their ill-fated journey up through Dog Valley on their way into what may have been the deepest snow ever to have fallen in the region. By 1872, Nevada had become a state, the city of Reno had been founded, was the seat of the newly created Washoe County, and the famed Virginia and Truckee Railroad began daily operations hauling silver ore (and sometimes cattle raised in Washoe Valley) from Virginia City to the trans-continental railroad line which ran through Reno and the smaller railroad town of Sparks. In the following 40 years, the University of Nevada had been founded and relocated to Reno where it opened its school of mining. The Empire Club opened as an all-purpose entertainment establishment featuring everything from gambling to what the locals referred to as “horizontal refreshment”. On July 4th, 1910, heavyweight champion of the world Jack Johnson fought retired champ James Jeffries in a makeshift ring in front of 20,000 people near the freight yards downtown. It was called “the fight of the century”, but you’ll get to read more about that in a future installment. In 1931, gambling was officially legalized in the state of Nevada, while the requirement for residency in order to attain a divorce was lowered to just six weeks. Divorce attorneys could not relocate here fast enough. Unhappily married couples with money to lose flocked to Reno by the trainload to spend the summer swimming up at the lake, playing the nickel slots, and waiting to stand before a judge and say the words “I don’t, any more.” Divorce is still a top ten industry in Nevada to this day. 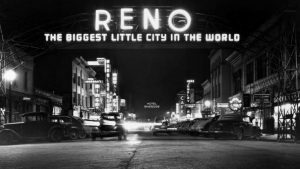 Harrah’s opened in 1937, and then came The War, which affected Reno just about the same as it did any other mid-sized city in the United States. The boom of the 50’s was no different here either, with the one exception being that many people came from all over the world to play, to gamble, and to indulge in other vices that could not be had elsewhere. The Air Races fired up in 1964, and still remains the fastest motorsport in the world to this day. Vintage aircraft race alongside modern day planes on the third weekend of September every year. The 70’s saw a boom in modern day gaming establishments; the El Dorado, Circus Circus, Peppermill, Atlantis and Fitzgerald’s opened their doors to the gaming public. All but Fitzgerald’s are still in operation. There are a few noteworthy events that happened in the 80’s and in the ensuing three decades, but we’ll save those for another time. We hope you enjoyed this overview of local history, and look forward to getting more in depth with future installments. Check back with OnReno.com every Friday for new – or rather old – stories about past times in Nevada. Garrett is a graduate of the University of Nevada who’s lived in the Reno area since 1988. He has a passion for writing, history, useless trivia, video gaming, pop culture, and bad puns. He also believes every life has a story to tell, and that sometimes the most seemingly mundane lives have the most profound impact on the course of human events. Garrett enjoys rainy evenings, long sits on the couch, good books, good movies and good food. He lives just east of Sparks with his two dogs, River and Washburn. 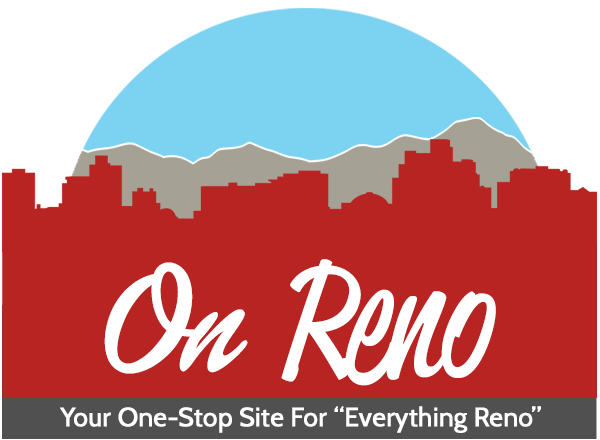 Discover the best of Reno shopping, restaurants, night life, breweries, events, business, outdoors, fun, local life, real estate, transportation, jobs, and schools. 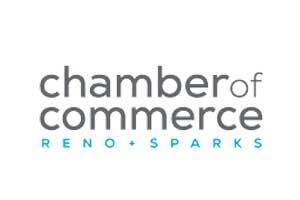 Looking for what to do in Reno? 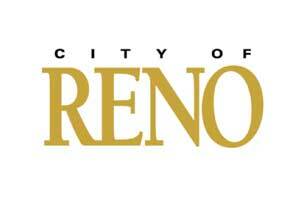 OnReno.com has columnists, and bloggers to keep you up to date on the best of Reno, Nevada.